Includes Compact Skimmerfilter with 6" faceplate, waterfall weir, 10' x 15' EPDM pond liner, 10' x 15' underlayment, 1450-gph pump, 25' of 1" kink free hose, barley straw extract, beneficial bacteria, black foam, construction guide and plumbing kit. Easy to handle, store and ship. Includes all the quality components to build a full size pond with professional results. Low maintenance equipment. Clear step-by-step assembly. 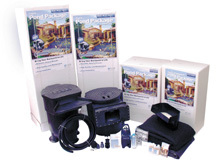 Each kit includes filtration system, pump, EPDM pond liner and underlayment, water conditioners, construction guide, black foam, patch kit, plumbing and hose.